[NEW YORK, NY] On the third anniversary of the Occupy Wall Street movement, the Rolling Jubilee has, for the first time ever, bought and abolished student debt: $3,856,866.11 of student debt owed by 2,761 people across the United States. Strike Debt/Rolling Jubilee/Debt Collective organizers are available for interview, as well as current and former Everest students. Tagged debt collective, Everest, occupy wall street, rolling jubilee, strike debt, student debt, tuition. [NEW YORK, NY] After years of awaiting trial Cecily McMillan was sentenced this morning to a term of incarceration of 90 days on New York’s Rikers Island and a probationary term of 5 years for allegations that she assaulted NYPD officer Grantley Bovel. Posted below is the official statement of her support team. On a broader level, there’s been a tremendous outpouring of public support in the wake of the verdict, for which Cecily and the team are truly grateful. We’re heartened, too, by the outrage this blatant, heavy-handed attempt to quash dissent has elicited from the public at large. The message this verdict sends is clear: What Cecily continues to endure can happen to any woman who dares to challenge the corporate state, its Wall Street patrons, and their heavy handed enforcers, the NYPD. We certainly think outrage is an appropriate response from economic and social justice activists and allies who are concerned about the silencing of those who push for change. The DA and the courts want to make an example out of Cecily—to deter us, to scare us, to keep us out of the streets. And we won’t let that happen. This ruling will not deter us, it will strengthen our resolve. At the same time we recognize that outrage is a blunt tool that can too often obscure important distinctions. Cecily’s story represents a confluence of a number of different kinds of structural and institutional oppression that impact different communities in different ways. Expressions of shock at the mistreatment and denial of justice for Cecily—a white-appearing, cisgendered graduate student—only underline how rarely we’re proven wrong in our presumptions that common privileges of race, class and gender-normativity will be fulfilled. It’s no great secret that police brutality and intimidation and railroading in the court system are an all-too-predictable part of life for many low-income black and brown people, immigrants, and gender nonconforming New Yorkers—the vast majority of whom receive far less than Cecily in the way of legal support and media attention. And while we’re furious that, in the wake of a violent sexual assault, Cecily might now be subject to the institutionalized sexual violence of the prison system, it’s only on top of our horror at the gross injustice that countless people with significantly less recourse experience daily at the hands of that same system. To build solidarity, it’s not enough to simply be a slogan or a meme—Slavoj Zizek told us during the encampment to “not fall in love with ourselves”. Solidarity means listening and extending ourselves when oppressed communities ask—not to try to lead, but to get our hands dirty and do the work. Building solidarity across the 99% is the only way to effectively fight the 1%, and to create genuine change. Though Zuccotti Park changed us forever, the true work began when we went back out into the world. Tagged cecily mcmillan, nypd, occupy wall street, Police Brutality, sentencing, sexual assault. Beyond Judge Zweibel, it is disgusting to see vast resources from taxpayers wasted for over two years to prosecute Cecily. Manhattan DA Cy Vance has refused to drop this case, pursuing maximum charges against Cecily while ignoring police violence and misconduct. This is unfortunately not isolated to Cecily’s case but is indicative of a system concerned not with justice but with the unrelenting harassment of dissenters and the powerless.”We are devastated by the Jury’s verdict today. It has been clear from day one that Cecily has not received a fair and open trial. The job of a judge during a jury trial isn’t to guide the verdict to fit his opinion. Judge Zweibel, who consistently suppressed evidence, has demonstrated his clear bias by consistently siding with the prosecution. In addition to suppressing evidence, he imposed a gag order on Cecily’s lawyers, which is a clear violation of their 1st Amendment Rights, and placed the burden of proof on the defense, not the prosecution. He is rightly known as ‘a prosecutor in robes’. In the two years awaiting trial, Cecily was never offered anything less than a felony charge, a charge that would stay with her for the rest of her life. While awaiting a trial, Cecily has lived in limbo for two years, not knowing what her future would be, forced to re-live her trauma every one of those days. Beyond the sexual assault and physical injuries she sustained, Cecily suffered PTSD and has had difficulty finishing her master’s degree and continuing her work as a union organizer and activist. Despite the chilling precedent this verdict puts forth for activists, we will not be deterred from seeking social and economic justice, as evidenced in the courtroom today. Though we’ve held our tongues throughout this trial as Cecily was personally attacked and degraded, we could not stand silent today in the face of such a gross miscarriage of justice. The people had to speak truth to power today by standing up and will continue to do so as long as this justice system continues to punish the 99% and protect the 1%. We recognize that, as poorly as Cecily has been treated these past two years, she was lucky enough to have an amazing support system comprised of representation from the National Lawyer’s Guild and Mutant Legal, as well as significant financial help from supporters of Occupy Wall Street and a team of ten who tirelessly worked to bring her case to light and support her through this trying time. It’s harrowing to imagine how many unfortunate people encounter this system without the resources Cecily had, though we know countless innocent people are forced to plea to felonies and ruin their lives every day in this building. We will be fighting this unjust verdict in the court of appeals. Cecily’s lawyers are optimistic, given the circumstances of the case and the gross bias demonstrated throughout, that we can win on appeal. Thank you all for your ongoing support throughout this trial. We know that many share our outrage at this verdict, if you would like to get involved in jail support, please visitjusticeforcecily.com to learn more about how to best support Cecily. Tagged cecily mcmillan, Martin Stolar, nypd, occupy wall street, Police Brutality, sexual assault, Trial. [NEW YORK, NY] After two years of delays, trial will begin for Occupy Wall Street activist Cecily McMillan. Set for this Monday, April 7th at 9:30am at 100 Centre St Room 1116 Part 41, Cecily’s case marks the last ongoing Occupy trial. 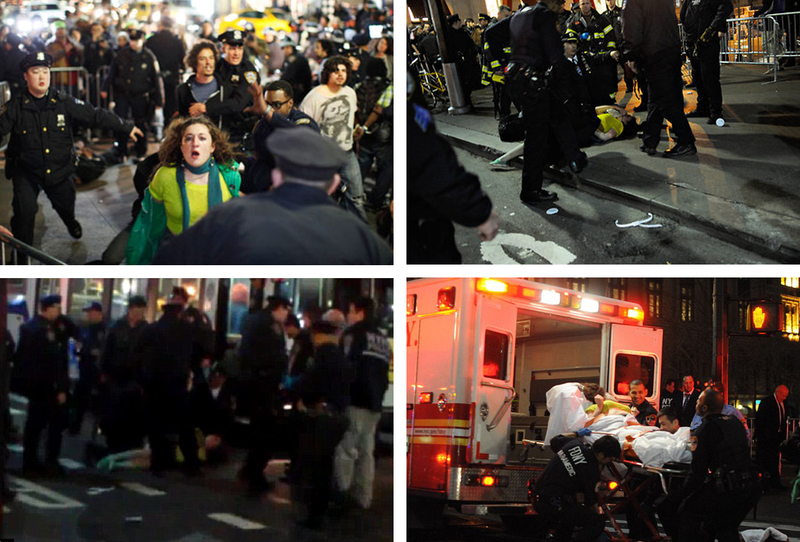 On March 17th, 2012 Cecily was sexually assaulted by a plainclothes NYPD officer and then beaten unconscious by police when she attempted to leave a gathering marking the 6 month anniversary of the inception of Occupy Wall Street. In the wake of this attack she endured, Cecily faces a charge of 2nd degree assault on a police officer. The heavy-hand of Cecily’s prosecuting attorney has led some activists to speculate that her political organizing within Occupy Wall Street plays a role in the prosecutor’s unwavering position. Others attribute the city’s stance to an unwillingness to admit guilt in the grotesque display of police misconduct on the night of Cecily’s arrest. Cecily’s firm commitment to nonviolence makes these charges even more absurd. A chilling tone has already been set by Judge Zweibel, who refused to grant a pretrial motion filed by Cecily’s attorney Martin Stolar seeking to open the personnel file of Cecily’s arresting officer. Officer Bovell’s file (if admitted by the court) shows a pattern of reckless behavior and aversion to conduct becoming to his uniform. Judge Zweibel’s interpretation is that Bovell’s history, albeit checkered, is ‘irrelevant’ to Cecily’s case and subsequently Judge Zweibel is setting a troubling precedent for all activists and victims of police brutality. Marty Stolar submitted a second argument of the motion, calling Zweibel’s decision too narrow. Supporters of McMillian are calling on activists and friends to #PackTheCourts and serve as witnesses each day of the proceeding. Supporters will be gathering before court April 7th with free breakfast provided by the Cargo Bike Collective and Occupy Guitarmy starting at 8am and a press conference with Cecily’s attorney Marty Stolar at 9am. Room 1116, Part 41 @ 100 Centre St.
You can stay up to date with Cecily’s support by texting ”@CecilysTrial” to 23559, or by visiting http://JusticeForCecily.com, updates are also regularly posted via Facebook HERE. According to the National Lawyers Guild, McMillan’s case is one of the last court cases stemming from Occupy Wall Street remaining on the docket. It may also be one of the most consequential. [NEW YORK, NY] Trial began in Manhattan Criminal Court Monday for Occupy Wall Street activist, Cecily McMillan, who faces 2nd degree assault charges stemming from a 2012 encounter with the NYPD that left her beaten and unconscious. Trial has been postponed until March 3rd due to the introduction of illuminating new evidence. McMillan was brutally arrested on the evening of March 17, 2012 at an event marking the 6-month anniversary of the group’s occupation of Zuccotti Park. The series of events leading up McMillan’s beating was documented extensively by the press, and began with a plainclothes male NYPD officer forcibly grabbing her right breast. McMillan was 23 years old at the time. McMillan, over the course of her arrest, sustained a violent beating resulting in bruised ribs, a seizure, and myriad cuts and bruises across her body. McMillan was hospitalized for these injuries. McMillan was later charged with felony assault of a police officer, Assault 2nd degree, a Class D felony in NY, which carries that sentence of up to 7 years in prison. Prosecutors, upon approaching trial, have indicated that they will ask the judge for a maximum sentence of 7 years. Many activists speculate that McMillan’s work as a political organizer has played a role in the prosecutor’s unwavering position. Others attribute the city’s stance to an unwillingness to admit guilt in the grotesque display of police misconduct on the night of McMillan’s arrest. Supporters of McMillian are calling on activists and friends to fill the courtroom to witness each day of the proceeding. You can stay up to date with Cecily’s support by texting “@CecilysTrial” to 23559, or by visiting http://Justice4Cecily.com, updates are also regularly posted via Facebook HERE. Cecily McMillan had her first day in court on Monday, after nearly two years of delays. On March 17, 2012 Cecily was attacked from behind by a police officer, and brutally beaten by several officers on duty at Zuccotti Park. An out-of-uniform police officer grabbed her right breast from behind, and Cecily instinctually raised her arm, making contact with the officer. She was thrown to the ground by the officer and then suffered blows from several other police officers nearby; following the attack, Cecily went into a series of seizures. The District Attorney is looking to discredit Cecily’s account of the night through questioning the veracity of her medical conditions, in spite of video and eyewitness accounts supporting the seriousness of her injuries. The prosecution is also trying to depict this as an isolated event – not connected to mass-arrests and grotesque police brutality exhibited by the NYPD throughout the night. Contrary to the prosecutor’s assertion that there was no context for Cecily’s arrest, there was a obvious goal of violent mass-arrests: 72 others were arrested that night and many more were man-handled by the NYPD. “The main issue here,” says Martin R. Stolar, McMillan’s attorney, “is the heavy-handed, over-policing by the NYPD during the Occupy Wall Street protests, which lead to crimes where none existed. It was a normal reaction for a woman to react, to be startled after having her right breast grabbed.” Rebecca Heinegg will be co-counsel with Stolar at trial.